Since seeing Print Club London at Port Eliot Festival last year, I’ve been hankering after having a go at printmaking myself so was thrilled to see a beginners’ course in lino printing advertised at Truro Arts Company. 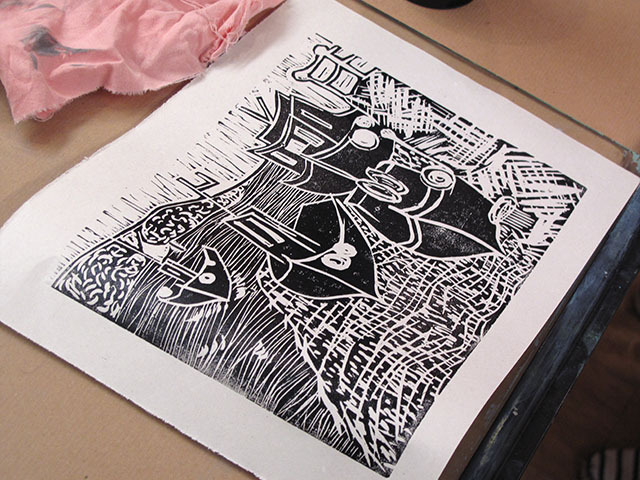 The lino printing course was to be taught by Lee Stevenson, a founder member of the Penwith Printmakers and a member of the St Ives Society of Artists. 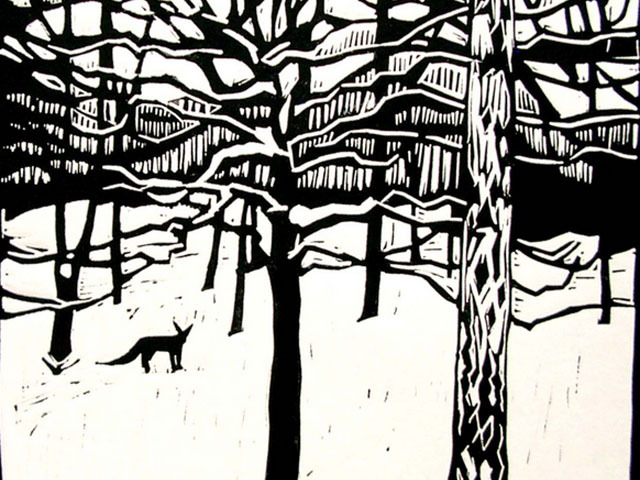 The stunning print of a fox in snow (above) is by Lee and the others which he brought to show us were equally beautiful. 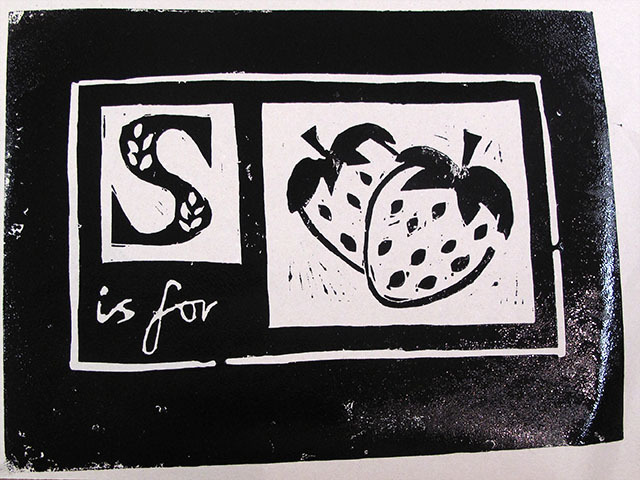 Armed with apron, cutting tools, a small piece of lino and a strong cup of coffee, I headed to class along with thirteen other keen students, ranging from complete beginner (me) to accomplished artists (definitely not me). Lee demonstrated how to make a design and transfer it to the lino using tracing and carbon paper, various cutting techniques using the ‘v’ and ‘u’ blades, and how to roll on the ink to create a print. We were then free to get printing…. 1. Transfer image to lino (remember it needs to be a mirror image) and start cutting out the areas which are to remain white. 2. 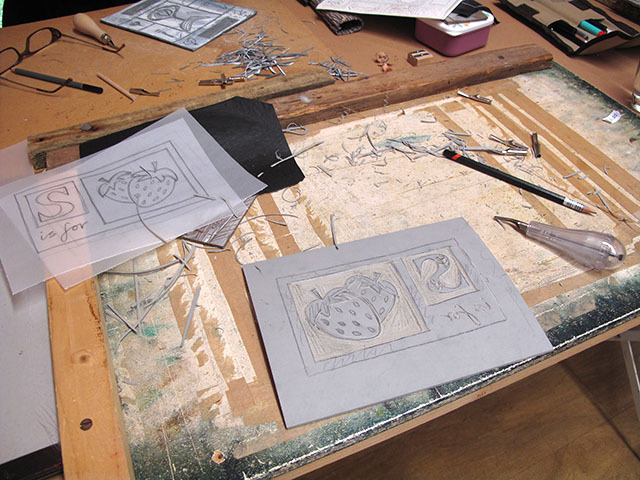 Using a little roller and water based printing ink, ensure that the lino is completely covered….not too little, not too much. 3. 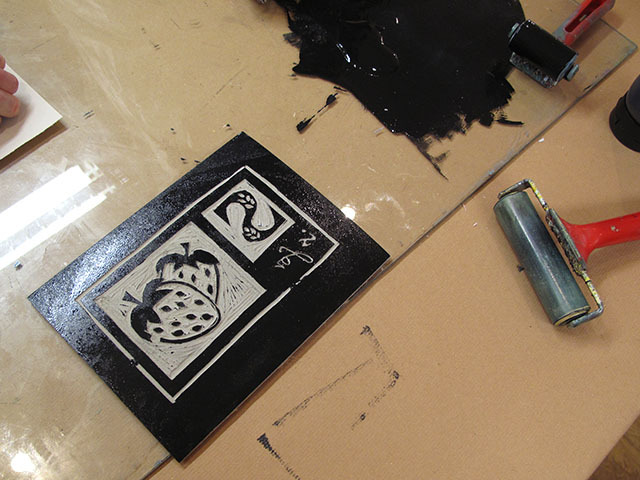 Place a sheet of paper onto the ink covered lino and rub firmly. Lee has invented the “wooden spoon wrapped in fabric” technique! 4. 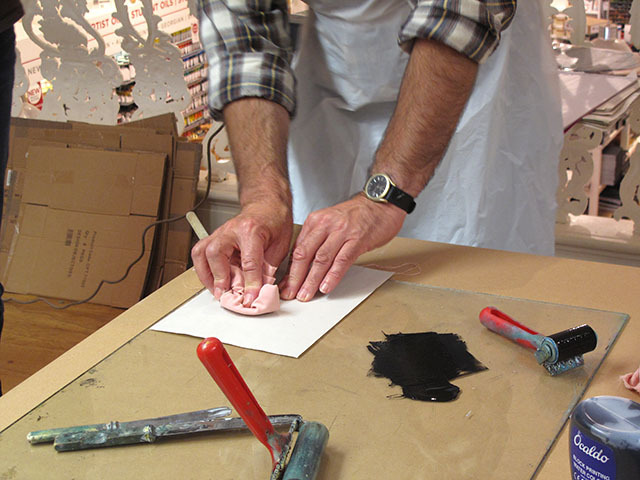 Carefully peel off the paper from the inky lino. 5. My first attempt – keeping it simple. 6. 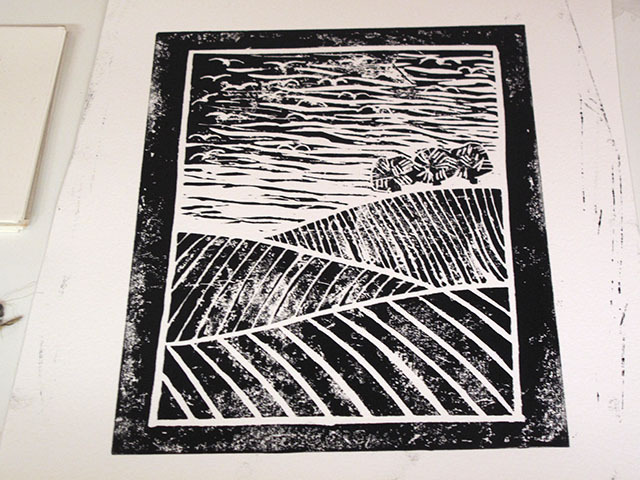 My second design: wintery ploughed fields and seagulls. Still plenty of room for improvement. 7. A beautiful boat scene by one of the ladies on the course. 8. 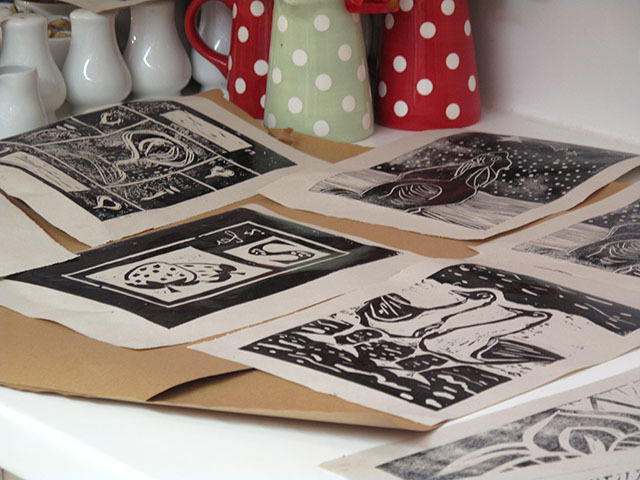 A selection of prints drying in the classroom. I have now invested in cutting tools, several pieces of lino, a roller and a bottle of ink (total cost around £30 – this is an affordable hobby). Be warned: all future birthday and Christmas cards will be homemade. I’m hooked! 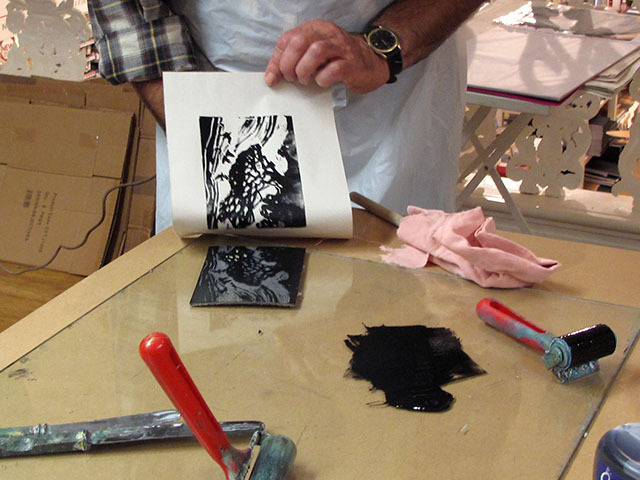 Lee is running one and two day workshops in relief printmaking at his studio in Rosudgeon. To find out more please send him an email. With its airy mezzanine for classes and the fabulous Arts Café downstairs (they will bring you drinks and food while you work), The Truro Arts Company is perfectly set up for running its regular art workshops.